Reyn #10 delves into the mysteries and secrets of Reyn’s past, as the Image Comics sci-fi fantasy series, written by Kel Symons (The Mercenary Sea), with art by Nate Stockman, colors by Paul Little, and lettering and Design by Pat Brosseau, explores the uncanny mythical and technological legacy of his creation and role in the Land of Fate! Writer Kel Symons has crafted an intricately detailed world with this series. After the shock revelations that the Land of Fate was really an artificial environment on one of three huge space arks used to evacuate the world before a catastrophe overtook the sun, along with how the Venn’s involvement caused the Great Cataclysm and influenced events on board, Reyn risked life and limb – quite literally – to rescue Seph from the Venn stronghold in the Rift, but the price was catastrophically high for Reyn! Now, as Seph struggles to cope with the full extent of Reyn’s injuries, Aurora finally reveals the shocking truth of who Reyn really is. This final issue follows Seph’s arduous journey to help her fallen comrade. It’s a voyage that takes her across the Land of Fate, with only Aurora to guide her, and once their final destination is reached he pieces of the puzzle slowly begin to fall into place. Kel Symons brings all the threads of this magical fable together with assured skill, mixing high drama, adventure, and humour as the history of the Land of Fate gradually unfolds. Aurora’s character has been one of the most delightfully quirky highlights of this series, for the most part Reyn has been the only one who could speak to her, but now that Aurora and Seph must work together to save Reyn, this issue finally reveals just how crucial Aurora’s role has been to ensuring the legacy of The Wardens of Fate continues. Seph’s relationship with Reyn is also a key factor to some pretty major events here as well, especially when she is faced with a heartrending choice that will ultimately decide Reyn’s fate. 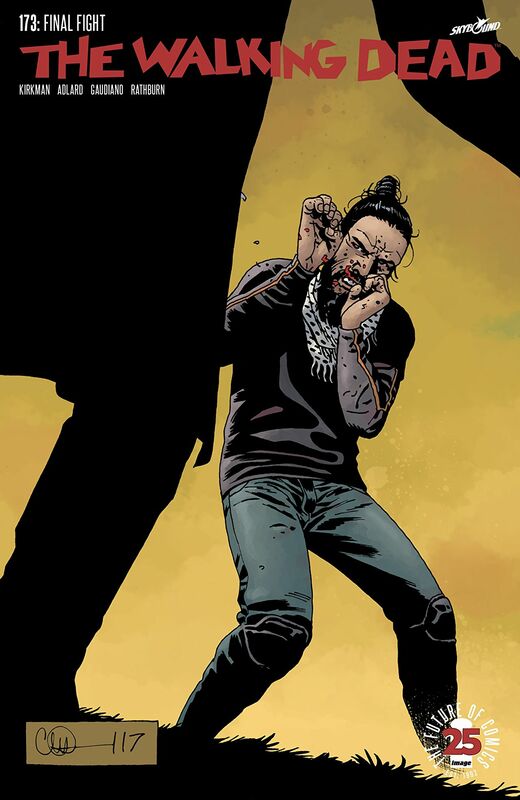 Reyn #10 is without doubt the pinnacle of Nate Stockman’s excellent work on this Image Comics series. Stockman’s incredible visuals have made every issue of Symons’ sci-fi / fantasy saga a joy to read, now the culmination of that epic adventure plays out in Reyn #10 as the storylines converge with Reyn’s, Seph’s, and Aurora’s destinies in the most sublime way imaginable. Nate Stockman brilliantly conveys Seph’s lonely journey across the Land of Fate, past events and the arrival of the Venn are relayed in vivid detail, and Reyn’s true beginnings gradually become clear in via striking blend of fantasy, monsters, and advanced technology. Paul Little’s colors are as lavish and vibrant as ever, and the lettering and Design by Pat Brosseau is exquisite. Everything is resolved in a way that is both completely indicative and as bold as we’ve come to expect from this outstanding sci-fi / fantasy series. Kel Symons concludes the story arc with a wondrous, perfectly staged coda, and Nate Stockman rounds everything off with a beautiful final page is simply breathtaking. Reyn was one of the most enjoyable new titles I had the pleasure of reviewing in 2015. Yes, I’m a bit late with this review of the final issue, but now that the trade collections of Reyn Vol 1: Warden of Fate and Reyn Vol 2 are both available, I though it would be a good time remind you all just how great this series was. Reyn was envisioned as a 10 issue storyline, but who knows, if the trades do well, maybe we will see more adventures featuring Reyn and Seph in the Land of Fate one day? Either way, the story ends on a high note, Kel Symons, Nate Stockman, Paul Little, and Pat Brosseau did some amazing work on this series, and I’d certainly recommend checking out the Reyn trade collections if you can – you won’t regret it. 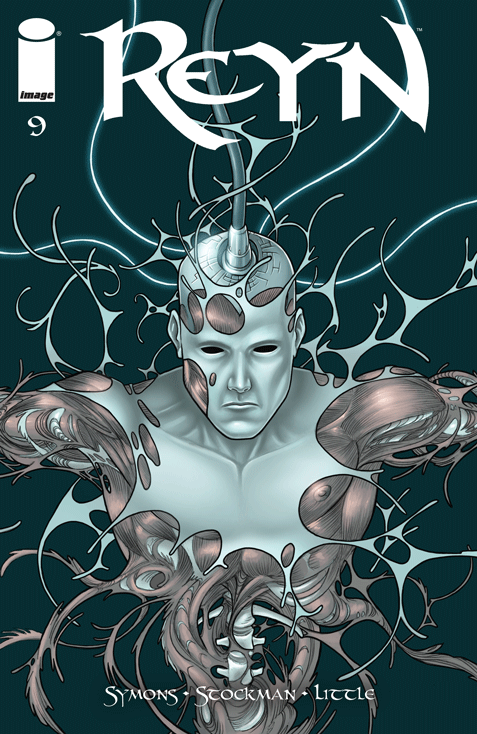 Reyn #9 continues to build on the startling revelations about the Land of Fate, as this Image Comics sci-fi fantasy series, written by Kel Symons (The Mercenary Sea), with art by Nate Stockman, colors by Paul Little, and lettering and Design by Pat Brosseau, finds Reyn betraying his allies and going it alone to rescue Seph – but to save her he will have to trade the vital component the Venn need to complete their plan. Discovering that the Land of Fate was in reality is a habitat on board one of three giant space arks used to evacuate the world before a great catastrophe consumed the sun in Reyn #6, effectively turned this series and its premise on its head, and forced all the characters to revaluate everything they once knew as reality. 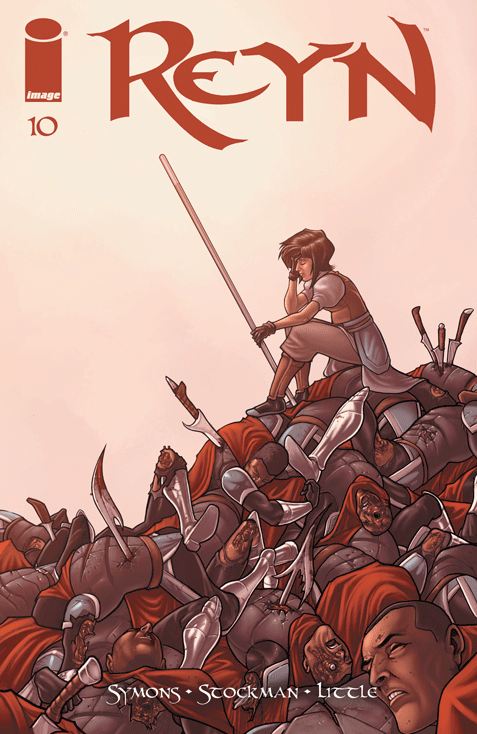 Kel Symons has crafted a magnificent storyline and Reyn #9 is arguably his finest issue yet, as events take another dramatic and highly unexpected turn after Seph finds herself a prisoner in the Venn Stronghold. When she is brought before the Venn leader, we finally begin to learn more about this strange amphibian-looking warrior race, and how their presence has influenced the development of the Land of Fate. Nate Stockman’s art for Reyn #9 is a tour-de-force of epic visuals which beautifully brings Symons’ innovative sci-fi / fantasy saga to life, as the Venn’s story unfolds; and the great cataclysm of events that follow their arrival lifts the series to even greater heights as the pieces of the past gradually begin to fall into place. The colors by Paul Little are rich and vibrant, cold metallic hues in the Venn stronghold contrasting strongly with the vivid tones used in the flashbacks, and the lettering and Design by Pat Brosseau is as excellent as ever. The main thing I like about this Image Comics series is how Kel Symons always keeps us on our toes. Just when you think you know what to expect, even with all the revelations about the Venn and their role in events, Reyn #9 delivers what is perhaps the series’ biggest surprise so far, and it’s one that’s sure to be a major turning point for the series. Reyn #9 is another fantastic issue, with Kel Symons exciting storyline, and the fantastic artwork by Nate Stockman, this Image Comics series continues to go from strength to strength, and after reading this action-packed issue I simply cannot wait to see what happens next. Brilliant! Reyn #6 expands the grand scope and scale of the Land of Fate like never before as this Image Comics fantasy series, written by Kel Symons (The Mercenary Sea), with art by Nate Stockman, colors by Paul Little, and lettering and Design by Pat Brosseau, sees Reyn, Seph, and their allies confronting the out-of-this-world revelations that have turned all of their lives upside down and shattered everything they once believed in. Nate Stockman’s artwork makes this issue an absolute joy to behold. The Sci-Fi and Fantasy elements all fuse seamlessly together with Symons intricate narrative to bring a whole new aspect to Reyn’s world. From the spectacular views into the great beyond past the view-port, to the moments of tension between the characters, it is the spectacular way Stockman illustrates the great cataclysm itself that really earmarks this issue as something very special indeed. The sheer attention to detail and depth of storytelling in these sequences are breathtaking. Paul Little’s colors are excellent as well, bold and vibrant, every beat of the story is captured impeccably, and the lettering and Design by Pat Brosseau is also as exceptional as ever. This issue concludes as the Venn begin their attack, the battle is furious, and a terrible loss will be suffered. Reyn #6 is another really exciting issue, it gets the new story-arc off to a great start, there are some interesting character and plot developments along the way, and the ending is certainly one of the series’ most shocking so far! 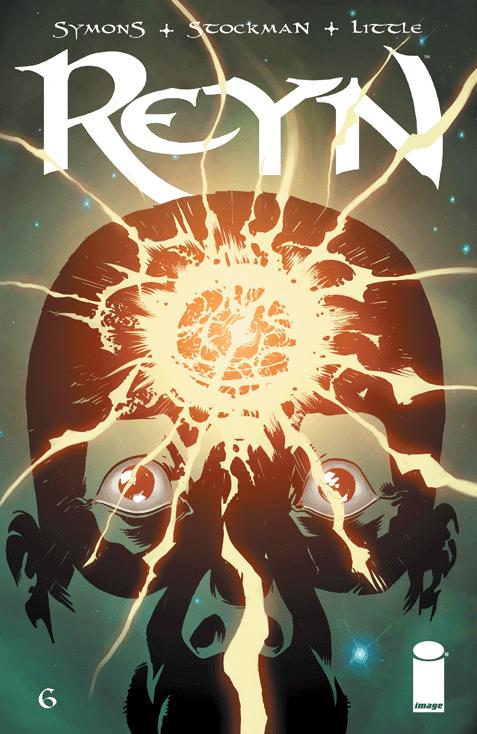 Reyn #6 continue to impress with every issue, with its terrific story by Kel Symons and superb art by Nate Stockman, this sci-fi embellished fantasy adventure series is certainly one that I would highly recommended, don‘t miss it! Oh, be sure to check out the superb Reyn Vol 1: Warden of Fate Trade-Paperback (collecting issues 1-5) which is also available now, perfect for fans of the series and for new readers to catch up with Reyn’s adventures.